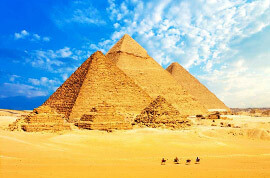 As one of the four ancient civilizations of the world, Egypt is a popular tourist destination which owns the famous Giza Pyramids, the Great Sphinx and Nile River. 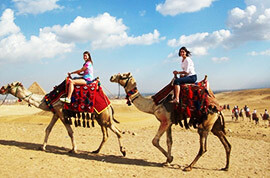 Pick our private Egypt tours and immerse yourself in the vestiges from old Egypt. The ancient Egypt was one of the four ancient civilizations and the oldest kingdom in the world with the well-known pyramids and Valley of the Kings. 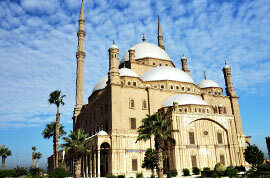 Even today, these destinations still make Egypt on the top list for tourists. 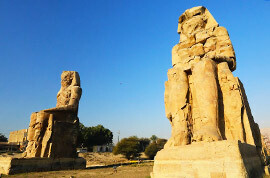 For the land view, the whole Egyptian land is a huge open-air museum where visitors can enjoy the marvelous architecture from thousands of years ago. 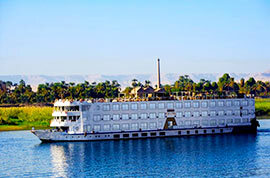 For the river view, visitors can experience the unique night view of the Nile River. For the sea view, visitors can take tours along the Mediterranean Sea or the Red Sea. Egypt has a Mediterranean climate with only two seasons around the whole year. Summer is from May to October while autumn is from November to April. The months from June to August are too hot and windy. The rest months are suitable for travel when the climate is mild. Along the Mediterranean Sea and the Red Sea, due to the humid marine climate, the coast areas have small temperature difference between daytime and nighttime. The more southward and the closer to the desert, the drier the climate becomes. Even during summer, the temperature may drop a lot at nighttime. Therefore, bring some warm clothes during the visit. For entering Egypt, travelers can take flight to cities such as Cairo, Alexandria, and Luxor. For traveling in cities like Cairo, subway and taxi are relatively ideal, other ways such as bus, minibus, sightseeing carriage are not recommended because they are either too crowded, not safe enough or not worth the cost. For inter-city travels, train and bus are convenient. Besides this, there are cruise ships at the ports for visitors who are not in a hurry. 1. Avoid using the left hand: in Egypt, it is extremely rude to use your left hand to touch utensils and food. It is even considered insulting to use your left hand to shake hands or pass things. 2. Clothing taboo: in Egypt, short, thin, transparent, and exposed clothing is forbidden. Wearing vests, shorts and miniskirts is strictly prohibited when visiting mosques. 3. Food habits: do not talk when eating. Don't make sound when drinking juice or hot soup. 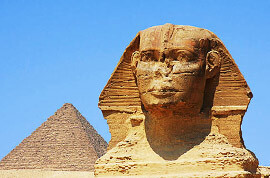 In 3200 BC, the slavery system of the ancient Egypt was established. From the 11th century BC to the 1st century BC, it was conquered by Assyria, Babylon, Persia, Ancient Macedonia, and the Roman Empire successively. In 1517, it became a province of the Ottoman Empire. It was ruled by France from 1798 to 1801, became a British colony in 1882, and gained independence in 1922. The Republic of Egypt was established in 1958 and formed the United Arab Republic with Syria. In 1971, its name was changed to the Arab Republic of Egypt. Most of the Egyptian land is low plateau with the altitude of 100-700 meters (330-2,300 feet). The terrain is flat and there is no big mountain. The highest peak of Mount Catherine is 2,629 meters (8,625 feet) above sea level. Deserts and semi-deserts account for 95% of the country's area. The western Libyan Desert occupies two thirds of the country's total area, most of which are quicksand. Inside the dessert, there are oases such as Kharga and Siwa. The eastern Arabian Desert is pebbly desert with bare rocky hills. The Nile River, the world's longest river, flows from south to north with 1,350 kilometers (840 miles) passing through Egypt and forming a large delta north of the capital Cairo. The main lakes are the Great Bitter Lake, Lake Timsah and the largest artificial lake in Africa, Lake Nasser formed by the Aswan High Dam.